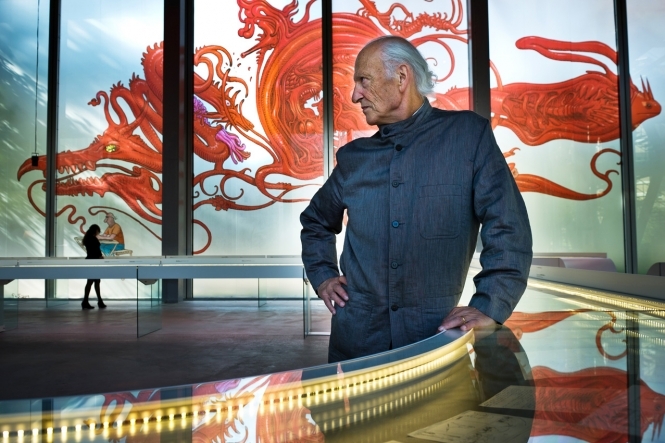 Jean Giraud, aka Moebius, at the exhibition “Moebius-Transe-Forme,” in 2001. Courtesy Fondation Cartier pour l’art contemporain. “Even when you reach a certain level of success,” Jean Giraud once said, “there’s still this desire to break the established rules and be a bit of a delinquent.” The cheerfully libertine Frenchman spoke those words in his early seventies, just two years before his death in 2012, but he had voiced similar sentiments throughout most of his adult life. 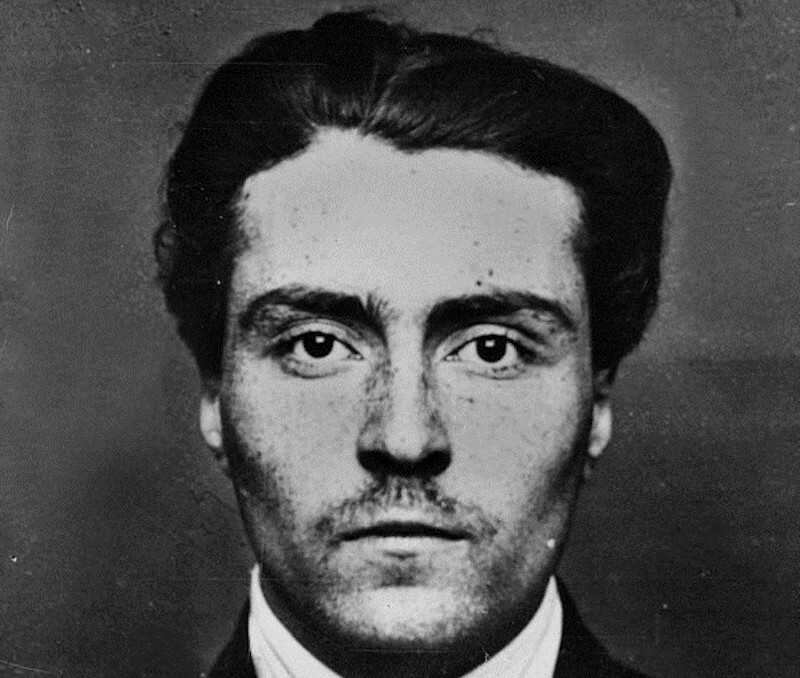 He was already established as an extraordinarily gifted comic-strip artist in his twenties, having created, with writer Jean-Michel Charlier, the immensely popular Western series Blueberry, which he signed as “Gir”; he nonetheless found himself intermittently beset by that restless desire to be “a bit of a delinquent.” A decade later, partly inspired by his infatuation with American underground comics and their countercultural freedom, that restlessness produced a creative eruption, a second artistic identity, and a second pseudonym: Moebius. His masterpiece is Le garage hermétique, an improvisation that, from 1976 to 1979, grew chapter by chapter into arguably the most inventive and multidimensional graphic novel ever created, a mad romp through a collation of oddly intersecting realities overseen by the indefinable Major Grubert. The book has, perhaps appropriately, never settled into a single definitive edition, and its admirers still debate the relative virtues of the original noir et blanc “classic” edition, translated into English and serialized in the magazine Heavy Metal in the late seventies, and the later “colorized” version created for publication by Marvel as a graphic novel in 1988 (entitled The Airtight Garage). It’s easy to see why: certain pages benefit greatly from the addition of color, as when the palest greens, blues, and mauves add an early-evening coolness to scenes in stony settings, or when stronger contrasts intensify the artist’s skillfully deployed areas of light and dark; on other pages, an unsubtle use of color detracts from the pristinely detailed line work; and still other pages leave one undecided between versions, or admiring of both. From Arzach, published in the July 1977 issue of Heavy Metal. In the supremely unstable universe of Moebius, characters exist and abruptly change in accordance with their creator’s fluctuating whims, an aspect of his art that became a central premise, to great comic effect. (It is awkward when one’s body suddenly shifts its form, improbably and ridiculously, a point that became the hilarious core of the early story “Shore Leave on Pharagonesia” and remained a reliably satisfying spice throughout the later works.) And Moebius, who liked to abandon himself to the flow of improvisation, produced a steady rhythm of surprises in other ways. Le garage hermétique, composed as a serial with very short chapters, reflects an anarchic authorial game in which its creator deliberately introduced new and abrupt conceptual complications each month to destroy the story’s coherence and give himself problems to which he would then have to invent solutions in the subsequent month’s installment—at which time, of course, he would also introduce further complications to destroy the coherence he had just achieved, to pose a new challenge for next time. 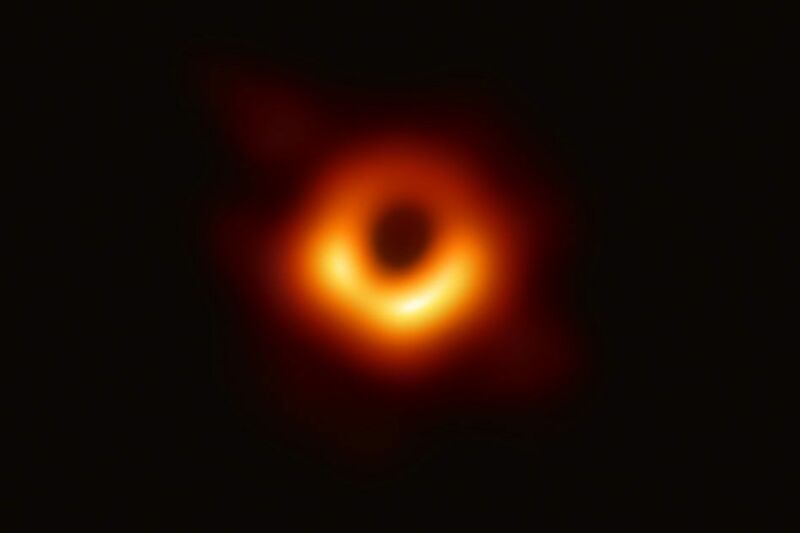 As he later explained, this state of “insécurité permanente”—the desire it inspired in him to re-create consistency and the satisfaction of then doing so—brought him “un délice absolu” (“absolute delight”). Elizabeth Bishop, when asked what quality she most valued in a poem, famously answered “surprise”—an element common to many forms of delight, whether at a child’s birthday party, in a researcher’s moment of discovery, or in a work of art. 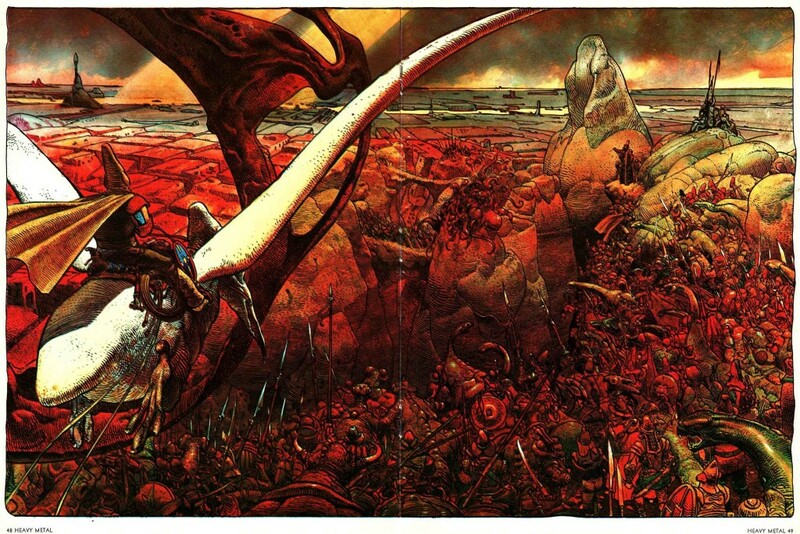 It is also essential to both comedy and suspense, and for Moebius it was central to his compositional process. Beyond his need to continually surprise himself, he also spoke of setting aside his rational “decision center” and allowing his hand to become “autonomous” when he created as Moebius (his works as Gir were necessarily more disciplined). 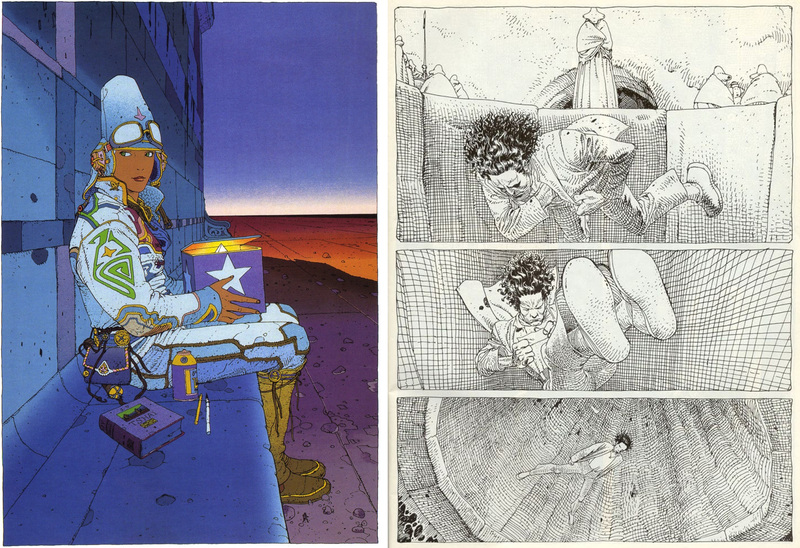 Moebius played with the more formal ligne claire tradition in his series Le monde d’Edena (The World of Edena, sometimes referred to as “the Aedena cycle” in English), particularly in its first two volumes. The second, Les jardins d’Edena, first published in 1988, achieves a gorgeous balance of subtlety and boldness in both its line art and coloring. It seems to glow with life, a fitting reflection of the lush, Edenic vision it portrays—and so appealing that Moebius revisited its imagery in 2011, for a series of illustrations commissioned by the fashion house Hermès. But no single style could contain him, and even when he returned, as he did throughout his life, to past characters, series, or themes, it was never to repeat them but to elicit new variations. From Voyage d’Hermès, Moebius’s campaign for the fashion house Hermès. This interest in change is already signaled in his Arzach stories from the seventies: four wordless, lavishly painted fantasy-adventure dream vignettes titled, in a playful nod to mutability, “Arzach,” “Harzak,” “Arzak,” and “Harzakc.” Three decades later, the character Arzak resurfaced alongside other Moebius stalwarts—the Western hero Blueberry, the science-fiction duo Stel and Atan from the Edena series, and Major Grubert and Malvina from Le garage hermétique—in a self-parodying yet self-searching sketchbook-as-graphic-novel series called Inside Moebius, published from 2004 to 2010 in six full-color volumes. Drawn in a looser, freer hand, and by far the most “cartoony” of Moebius’s series, its protagonist is the author himself, portrayed as a bald older man, eager to create but irritated by his sometimes uncooperative characters (who resent his power over them), his unenlightened younger self (forever puffing on a joint, an indulgence the older self has renounced), and other individuals and situations that disturb his peace, plans, or philosophical notions. Although easily misperceived as simply an in-joke, the series is both an entirely winning exercise in drollery and something far greater: a seven-hundred-page comedic tour de force that effortlessly meditates on art and reality. 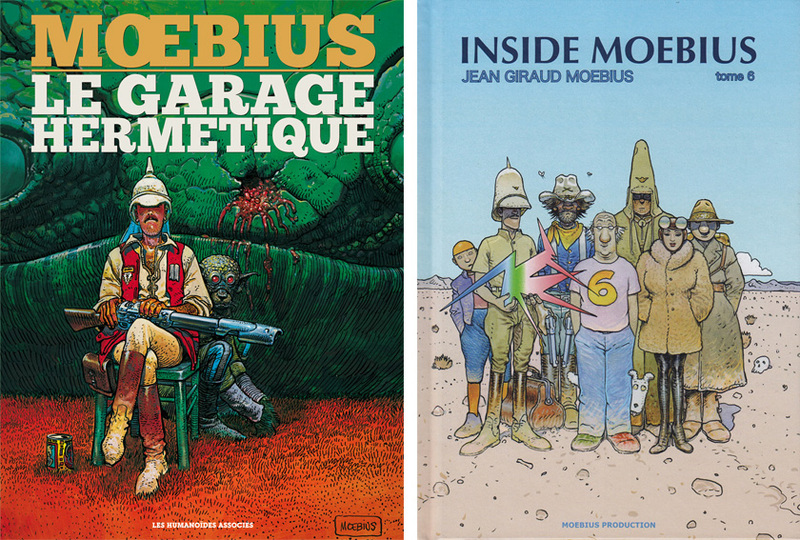 In its original French edition, the half-dozen hardcovers of Inside Moebius are among the wittiest, most handsomely produced, and most delectably colored books of this or any other artist’s career. The last half of the final volume unleashes an onslaught of surreal wordless imagery that brings the series to a kind of mind-blowing crescendo. Giraud’s identity as a protean master reached fulfillment in “Moebius-Transe-Forme,” an exhibition at the Fondation Cartier in Paris in 2010. Built primarily on works from the preceding decade—including that final volume of Inside Moebius—the show traced diverse threads running through the artist’s visual universe and persuasively argued that transformation (with its many implied corollaries, such as instability, surprise, revelation, evolution, chaos, and possibility) is either the great theme of his oeuvre or at least one of the most useful prisms through which to view it. 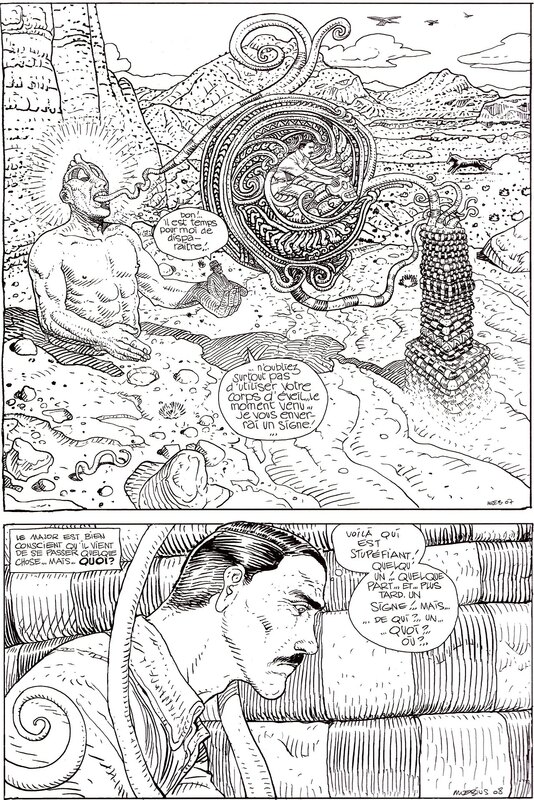 In early 2011, while the museum exhibition was still up, Moebius published Le major, a limited-edition sketchbook-as-graphic-novel, this one in black-and-white, in which Major Grubert, now more a recluse than a man of action, struggles with questions of good and evil, life and death, and the nature of reality. He finally receives “la clef des rêves” (“the key of dreams”), which appears to empower its user to unlock his own dream world in which he will experience a kind of free reign much like that of the author-artist. Both a complement to Inside Moebius and a coda to the earlier Garage-related books (most notably the 2008 Le chasseur déprime, which depicts Grubert’s phantasmagoric confrontation with mortality and transcendence), Le major is a quiet but fitting finale to the life and career of its author: inventive, unusual, deeply intelligent, amusing, and uninhibited. 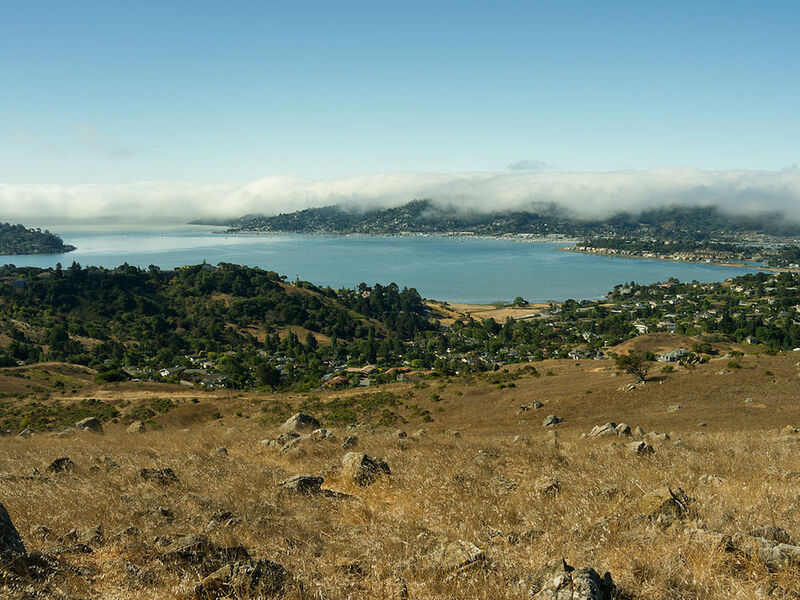 Robert Pranzatelli is the founding editor of the Folio Club, an independent publishing project, and the author of two short e-books, A Chameleon Poet: Truman Capote and String Quartet: Four Stories. 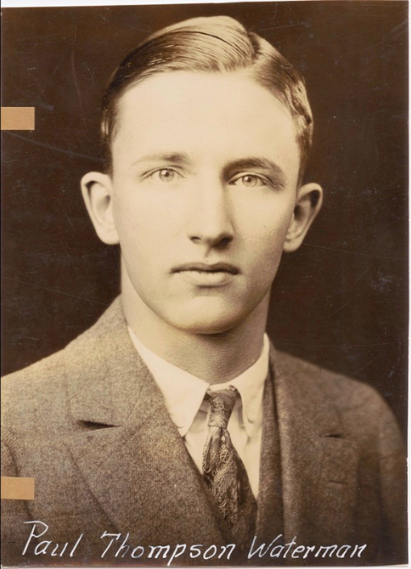 He is also a longtime staff member of Yale University Press.